The Power Sleeve is all you will need for your Apple iPad Pro 9.7, especially when you are always on the go. The most unique feature about the sleeve is the routed USB to Lightning Cable that is included with the sleeve. It is MFI certified so it is perfectly safe and compatible with your device. 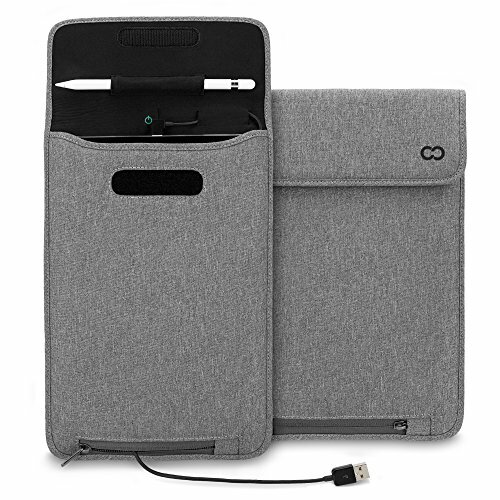 You will notice that it is securely placed within the sleeve so you can connect it to your iPad Pro 9.7 at the top. At the bottom, there is a small zipper pocket that allows access to the other end of the cable. It is 3 ft. long so you can extend it and connect it to a powerbank (not included) to charge. Simply tuck it back in the pocket when not in use. Another great thing about the cable is that the lightning cable is angled so you can conveniently charge your device while it is still inside the sleeve. There is a tiny pocket located at the top of the sleeve (where the power icon is) so you can tuck in the lightning cable when it is not in use. This will keep your cable safe for long-term use. The sleeve is padded and durable to keep your device safe. It is made from canvas material, and the interior is made from neoprene. There is even a designated place for your Apple Pencil. Simply slide in your Pencil in the holder inside the main flap. The velcro closure for the main compartment will keep everything in place. Sleeve with Apple Pencil holder for iPad Pro 9.7 2018 / 2017 and iPad Air / Air 2. Can fit Apple Smart Keyboard. Included: Routed USB to Lightning cable (angled & MFI certified). Length: 3 ft. Charge iPad Pro 9.7 while inside the sleeve with the angled cable. Pocket with zipper cable available to hold cable. Exterior: Canvas material. Interior: Neoprene. Secure velcro closure. If you have any questions about this product by CaseCrown, contact us by completing and submitting the form below. If you are looking for a specif part number, please include it with your message.